DETROIT - In another down-to-the-wire match, the Detroit Waza Flo (3-12) fell once again, this time 6-5 at the hands of the St. Louis Ambush (5-11) Saturday night. Detroit lit up the scoreboard first with a goal from Danny Dragoi just two minutes into the 1st quarter, sending the Waza Flo bench onto the field in celebration. After close attempts by Detroit's Scotty Wright and Drew Ducker, St. Louis' Odaine Sinclair found the netting to tie the game at 1-1 with nine minutes left in the 1st. Toward the end of the opening quarter, the Ambush's Corey Adamson, who was then traded to the Milwaukee Wave on Sunday, just before the deadline, bounced a shot off the upper crossbar and down just in front of the line at goal. The referee called no goal, and without goalline technology, the Ambush had to accept the call. The 2nd quarter began and ended in a tie, with each team scoring once within seconds of each other. Ross MacGregor snuck a shot into the bottom left corner of the net to give the Ambush a 2-1 lead. But just 30 seconds later, the Waza Flo's veteran powerhouse Worteh Sampson came right back to slam in the equalizer and tie the game at 2-2. The game went back and forth the entire way, to the delight of the fans. Just a minute into the 2nd half, Sinclair secured his second goal of the night to give the Ambush a 3-2 lead. 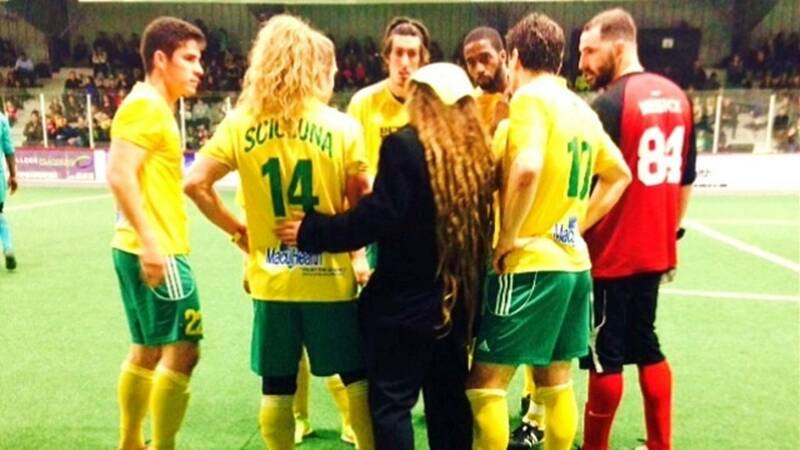 Waza Flo owner, coach and player Dominic Scicluna responded by connecting on a bicycle kick right in front of the net, but Ambush goalie Greg Cook barely blocked it. Seconds later, Detroit's Zane Polack had a long drive shot that bounced off Cook and rebounded to Zach Bowman, who tied the game at 3-3 with 10:30 left in the quarter. But St. Louis came right back less than a minute later with a goal by Adrian Gabeljic to take a 4-3 lead. Detroit's veteran captain Miki Djersilio, who personally guaranteed he would score twice on the night, scored a shorthanded goal with five minutes left in the 3rd quarter to even the score. Jeff Dimaria helped the Ambush retake the lead with 3:30 minutes left in the 3rd, a score that held through the end of the period. The path of the game started to turn towards the Ambush when they increasef the lead to 6-4 off a breakaway in which Waza Flo's goalie came out to challenge, but Gabejic got around him and scored the empty netter for his 2nd goal of the night. A questionable call in which Polack was given a five-minute misconduct penalty took its toll on Detroit as he remained in the box until the end of the game. Polack is now out for the next and last two homes games due to the MASL's new ruling that anyone spending an accumulating 15 minutes in the box will be placed on a two-game suspension. Scicluna made the call a minute later to pull the goalie and put in the 6th attacker. Gabeljic was then called for tripping and Detroit went on a two-minute power play with just minutes left in the game. Djerisilo made good on his guarantee and snipped his 2nd goal of the night with only 2:30 left in the game to close the gap to 6-5. Djerisilo drove and tried to push for another goal but was given a yellow card. Despite Detroit's best comeback effort, St. Louis pulled off a 6-5 win. The Waza Flo find themselves need a change that will turn "so close" games into wins. Their next match is Saturday against the Harrisburg Heat (1-13) at 7 p.m. at Melvindale Civic Arena (4300 S. Dearborn St, Melvindale, MI 48122). This Saturday's game will feature "BoGo with the Flo," which means if fans buy one adult ticket at $12, they get a free ticket for kids ages 3-12 or a teen (ages 13-18) ticket for just $4. You can buy tickets online right here, or watch all MASL games live on www.golivesportscast.com. For continued coverage on all things soccer in Michgan, stay tuned to ClickOnDetroit.com/sports/soccer and follow @Local4Sports and @KellyHaapala on Twitter.